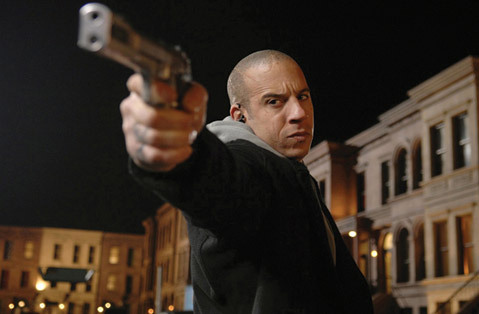 Vin Diesel, Michelle Yeoh, and Melanie Thierry star in a film written by Eric Besnard and directed by Mathieu Kassovitz. True science fiction film fans haven’t had much to chew on lately. In fact, the last epic universe-encompassing yarn was Vin Diesel in the under-appreciated Chronicles of Riddick, where he played a man/creature of transcendent death-dealing prowess in a universe beset by space colonizers who combined Visigoth culture with art deco technology. In this film, Diesel is again a lone wolf: a cool yet noble mercenary-like a Bogart character, but with more colorful tats. The film offers him texts and landscapes to transverse stylishly. Sometimes he’s in Children of Men, then Bladerunner, Dune, and even the Russian neo-vampire saga Daywatch. Yet Babylon A.D. rarely seems derivative. The big problem with it, besides a pointless title, is that Babylon‘s a really great sci-fi film until suddenly it isn’t. Much has been written about director Mathieu Kassovitz (Gothika) and his struggles to finish this film, which most agree was over both budget and schedule when the studio took it over. What most accounts don’t mention, however, is the astonishing beauty of Kassovitz’s action segments and the gorgeous little flourishes throughout the film, such as the scene where Toorop (Diesel) is picked up in a car dangling from a helicopter magnet, or the visual display inside Gerard Depardieu’s cool tank. On the other hand, the film’s intricate layers do seem too daunting, so that even before the whole thing is summarily (and lamely) concluded, you’ll probably wonder how so many strands could possibly be knit into even techno-dystopian action film sense.